BATTLESHIP WISCONSIN ORIENTATION CENTER, "WISKY WALK"
Prior to boarding the Battleship Wisconsin, visitors are provided with an overview of the ship's design and operations, life aboard ship, its theaters of operation and the significant engagements in which it participated. The 1,200 square foot exhibit's architecture reflects shapes, materials, finishes and colors that might be found in naval architecture. Perforated and flanged angled steel supports, gracefully curved signage, mahogany-stained oak trims, and naval symbols all contribute to the nautical identity of these exhibits. 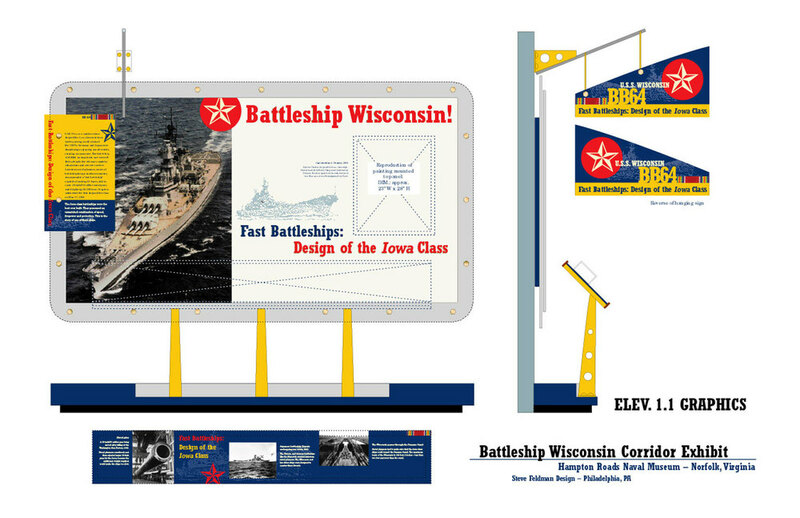 Video presentations of the ship in action are combined with large-scale artifacts, uniforms and historical images to create a lasting impression of the scale, impact and power of the battleship. "What we once viewed as a problematic exhibit area has become one of the most popular exhibits in the museum. The design draws attention from visitors of all ages and backgrounds. Steve knows how to work within budgets of all kinds."